You can go to one show this year, just one, and feel unbridled satisfaction for the rest of your days. 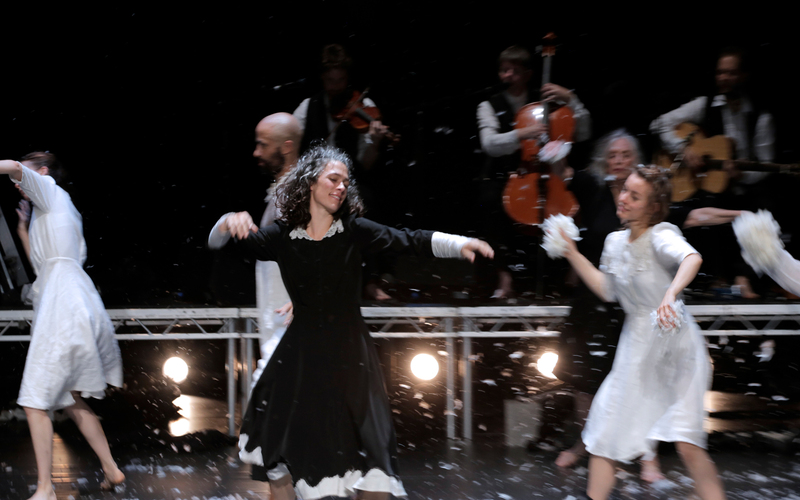 I saw Loch na hEala last year in Belvedere’s theatre during the Dublin Theatre Festival. I didn’t know what to expect, I just heard it would be pretty special and that the entire ensemble had been living together, not just practicing moves but breaking bread together each day and generally following a holistic lifestyle in preparation for performances. I was intrigued and rightly so. The energy of that performance remains with me. Live music was performed by seated musicians upstage, while dancers who moved as though channelling another realm, twisted and turned, even balanced majestically on breeze blocks. The simplicity of the colours in the costumes and set only heightened the tremendous prowess of these wonderful people as their stories unfolded. Every movement, from lightness to gut-wrenching torment was somehow translated through motion and stillness. I hardly remember the dialogue, even though it was delivered by the fantastic man that is Mikel Murfi. I left that theatre with one thought, that I was so glad to be alive at that moment, witnessing it. That is what great live theatre can do – show you that there is magic in this world and all it takes is being there to know this. Watching a documentary on the making of Bruce Springsteen’s ‘Darkness on the Edge of Town’ album, I was struck by these words as they said what I feel about the power of being at a live performance. This was how I felt when I saw him live a few years ago, but it also applies to all live experiences. I felt this way when I saw ‘Swan Lake’ too. You only need to go to one thing in the theatre for 2018 but perhaps go on the first night as you might just want to go again.